President Donald Trump’s first year in office has been marked by ongoing turmoil — including in his own Republican party, where presidential tweetstorms, inflammatory rhetoric, and high-profile dissent have fueled open conflict. In “Trump’s Takeover,” airing Tuesday, April 10, 2018 at 10 p.m. on CPTV, Frontline’s acclaimed political team tells the inside story of a president who vowed to take down the Washington establishment, and who has fought an intense war for control of the GOP. “Our in-depth look at this contest, waged over the first year of Trump’s presidency, is a window into the potential lasting impact of the Trump era on the Republican Party and the American political system as a whole,” said Frontline filmmaker Michael Kirk (“Putin’s Revenge,” “Divided States of America,” and “The Choice 2016“). Gripping and revealing, the documentary tells the story of Trump’s takeover of the Republican Party — from the perspective of Republican lawmakers and insiders themselves. “Somebody needs to stand up and say, ‘This is not our party. This is not behavior that we should condone. We shouldn’t be okay with this. This is not normal,’” said Sen. Jeff Flake (R., Ariz.), one of the few legislators in his party to proclaim this point of view so publicly. His comments come in a far-ranging interview with Frontline on everything from his first, highly combative meeting with Trump, to his decision to join the record number of Republicans who have announced they will not seek re-election after their current terms end. 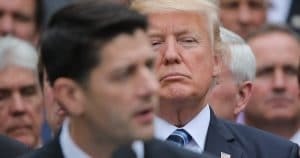 Through interviews with longtime Republican legislators, House Freedom Caucus members, senior White House officials, Trump confidantes, authors, and journalists, “Trump’s Takeover” examines how hopes for unified Republican control in Washington were challenged by divisions inside the party. It explores how Trump has fought for control of the GOP and is remaking it in his own image, publicly attacking those like Flake who defy him. The following week, on Tuesday, April 17, 2018 at 10 p.m., Frontline continues the story of the Republican Party’s evolution with “McCain” – an exploration of Sen. John McCain (R., Ariz.)’s complicated relationship with President Trump and the Republican Party, as well as his life and politics. 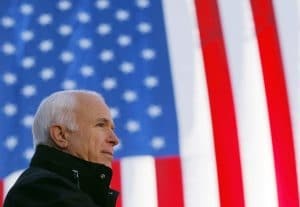 Drawing on both new interviews and Frontline’s deep archive of reporting, “McCain” traces the conservative standard-bearer’s motivations and his political history — from his experience as a prisoner of war in Vietnam, to speaking out against torture during the Bush administration, to his dramatic vote against the GOP’s health care bill last year. “By McCain ending Trump’s initiative, by McCain putting his hand up and saying, ‘Stop,’ it was a roaring back for the Republican establishment,” Robert Costa of The Washington Post and Washington Week tells Frontline. But the film also examines how, with his 2008 nomination of Sarah Palin as running mate, McCain himself contributed to a growing challenge to the party establishment: “That was really the first time that you had this establishment versus grass roots conflict,” said Republican pollster Frank Luntz. Both “Trump’s Takeover” and “McCain” are must-watch documentaries for anyone who wants to understand American politics in the Trump era. For more information on these and other Frontline documentaries, visit pbs.org/frontline.